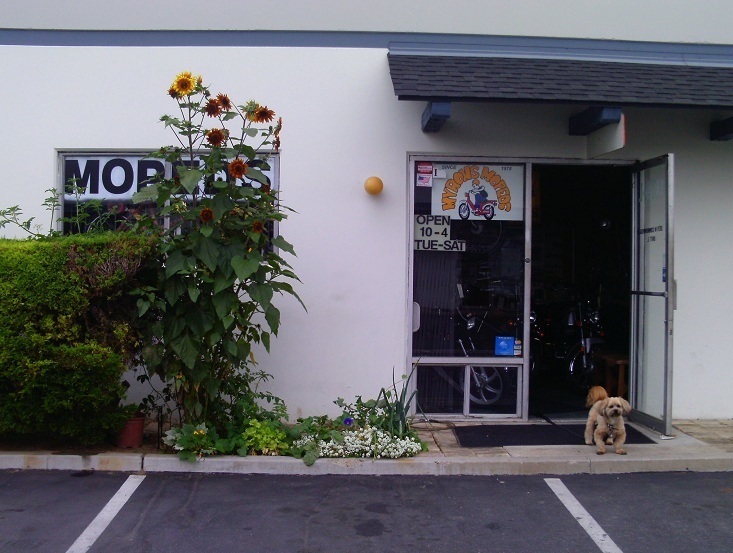 Myrons Mopeds is the only moped shop remaining from the 1970’s in southern California. 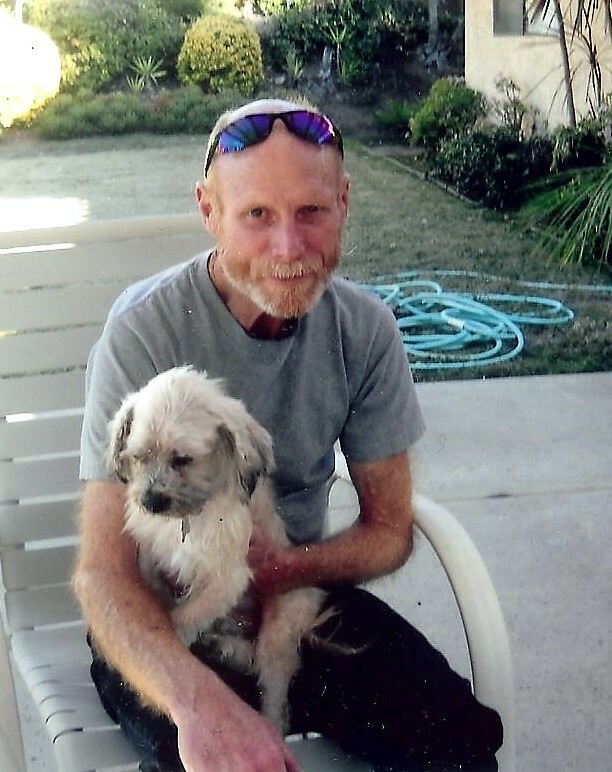 It is operated by Shaun Strahm, who serviced mopeds daily for 35 years, from 1978 to 2013. Since 2013, Shaun has stopped doing service and bike sales, instead focusing on this website-encyclopedia and parts sales. The goal is studying, documenting, displaying and explaining every (US model) moped and moped part. This website is for your enjoyment and practical use. Thousands of images and hundreds of pages of text, are all free for the public. Enjoy! Click on these links to visit the newest sections, updated or revised. These are the major revisions. Many more minor ones are not listed. 2018-12 10,000 spokes in 200 different sizes are listed and explained. Most are offered. 2018-12 Every spoke at MM is identified, from 200 wheels and 20+ moped shops inventories. 2019-02 Dellorto SHA type Italy-made carburetors 1960’s to 2010’s explained. Parts offered. 2019-01 Brands/Italy/Misc Italian Harley Davidson (Aermacchi) US models 1961-78 are shown. 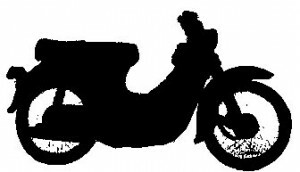 2018-12 All AMI-50 4-stroke moped parts are listed. Most are offered. Parts illustrations are revised. 2018-12 Every US-model vintage Yamaha up to 1993 is listed, displayed, explained. 2018-12 Confusing early models are understood. History and two-stroke development is appreciated. 2018-12 Baby Mikuni Japan-made carbs for 50cc mopeds are shown. Parts are listed. Some offered. 2018-10 Mikuni jets for many motorcycles are displayed and listed. Many are offered for sale. 2018-11 Parts/Controls/Magura Installing a 1970’s Magura wrap-around throttle cable is added. 2018-11 Over 1000 different sizes and types of metric bolts, screws and nuts are listed and offered. 2018-11 Many are original replacements, for when it is desired to match the existing original bolts. 2018-10 All vintage Franco Morini (FM) engines 50-80cc 1954-1999 are displayed and explained. 2018-12 Parts for most 1970’s-80’s engines are illustrated, explained, listed. Some are offered. 2018-10 (all sections) Until now, item prices that appear in many places had a link to a single place. 2018-10 The price of a 6×25 hex bolt would say “see Hardware“. Shortcode variables make that obsolete. 2018-10 In future revisions, shortcode variables replace links, for the price of items listed in many places. 2018-10 The only other change visible is “shortcode new” price is a lighter green than “new“ price. 2018-09 Brands/Italy/Misc Italian Table of Contents is a “who’s who” of vintage Italian mopeds. 2018-09 All US-model and many Euro-model Italian moped brands and their manufacturers are listed. 2018-09 Twenty 1966-70 Italian-model moped advertisements are added, each in their brand section. 2018-09 Moto Graziella, Moto Guzzi, Motom, Negrini, Omer, Paloma, Testi. 2018-09 Many Euro models and all US models, including Concord, are specified and displayed. 2018-09 The underlying connection between Fantic and Agrati-Garelli is explained. 2018-08 A large color-coded cut-away illustration comparing the DP50 and DK50 engines is shown. 2018-07 Brands/India/Hero Majestic Some 2003-2006 Hero, TBS and Yumbo flyers are added. 2018-07 Parts/Cables, Hardware/Cables Vespa and Trac cables are illustrated and added. 2018-07 Brands/Korea/Trac Parts catalog illustrations are scanned, enhanced, colorized and added. 2018-07 Many parts for 1982-1990 Trac mopeds and nopeds are shown. Some are listed and offered. 2018-06 Brands/Slovenia/Tomos Models Myrons Tomos flyers and 2017-18 models are added. 2018-06 All US models 1975-2018 are displayed and explained with VIN codes, speed versions and specs. 2018-06 Brands/Slovenia/Tomos Grid 2 Part 2 of apps grid. What bikes each part goes on. 2018-06 All painted Tomos parts are in a Part Colors Grid, with actual bikes of each color-column. 2018-06 All US model moped colors are listed for each year and model in a Bike Colors Chart. 2018-06 This is to help eliminate mistakes or confusion between similar colors or bike models. 2018-05 Brands/Slovenia/Tomos Grid 1 Takes a minute or two to load. Part 1 of 2. 2018-07 All Tomos USA parts from 2012 are indexed in a massive 2300 row by 34 column applications grid. 2018-07 It tells the model and year range each part is original on. Tomos part names are also enhanced. 2018-04 Brands/Italy/Garelli 1967-70 Broncco Garelli mini cycles US models are added. 2018-04 All US models 1967-92, remakes 2000-02 and some Euro models are shown and explained. 2018-04 Engine parts for 1975-92 US models are illustrated and listed. Some are offered. 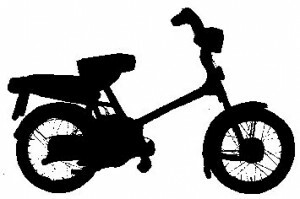 2018-03 All US models 1978-79, Puch-compatible, are shown and explained, including speed versions. 2018-03 Parts/Cables, Hardware/Cables–AMF, Batavus, Peugeot, Sparta cables are shown and added. 2018-02 Parts/Ignition, Magneto/Ducati, IDM, Iskra, AET AET magnetos are shown and explained. 2018-02 Bosch moped magnetos 1960-1990 are shown, explained. Parts are listed. Some are offered. 2018-01 Brands/Germany/Kreidler US-model Kreidler mopeds 1977-80 are shown and explained. 2018-02 Engine parts and some frame parts are illustrated and listed. Only some are offered. 2018-01 All parts for 1975-83 Peugeot 102 and 103 engines are illustrated and listed. Many are offered. 2017-12 Parts/Ignition, Magneto/Dansi,Motoplat,Wtemco Motoplat magnetos 1970-90 are shown. 2017-12 Brands/Italy/Malaguti Malaguti US models with Morini engines are displayed and explained. 2017-12 Brands/Italy/Bianchi Bianchi, Snark, Italvelo US models are shown and explained. 2017-12 Parts/Ignition, Magneto/Spark plugs, Points Plugs points condensers are shown and offered. 2017-10 Many CEV magnetos 1960-1990 are shown and explained. Most parts are listed and offered. 2017-11 Brands/England/NVT, Scorpion All US models 1976-78 are shown and explained. 2017-10 All Whizzer originals 1938-1965, and remakes 1997-2009 are displayed, listed and explained. 2017-11 Parts/Cables, Hardware/Cables Garelli cables are illustrated, explained, and offered. 2017-10 Brands/France/Peugeot Parts in other sections are listed. Peugeot history is appreciated. 2017-10 All Peugeot mopeds US models 1976-1983, and many Euro models, are shown and explained. 2017-10 A photo tour through the massive 1977 Cycles Peugeot moped factories is presented. Be amazed! 2017-10 Brands/Italy/Misc Italian 1970’s Beta mopeds are added. The relation to Bianchi is explained. 2017-10 Brands/Italy/Benelli 1965-75 mini-cycles, ’76-77 Blazer, ’77-80 G2 mopeds are shown. 2017-10 Brands/Italy/Moto Guzzi 1970’s Moto Guzzi mopeds are shown. SEIMM is explained. 2017-09 Parts/Carburetor/Keihin “baby” Keihin carburetors for vintage 50cc Hondas are shown. 2017-09 Keihin carb versions are explained. Parts are illustrated and most are offered for sale. 2017-09 Brands/Slovakia/Manet 1995-99 Puch Korado and parts are shown. Manet is explained. 2017-08 Parts/Engine/Engine Hardware Circlips (snap rings) and apps are illustrated and offered. 2017-08 Brands/Germany/Hercules 1972-82 Sachs and Eagle mopeds made by Hercules are shown. 2017-08 Hercules, DKW history and brands are explained. Some US-model parts are illustrated and listed. 2017-08 Brands/Germany/Sachs Motor Sachs engines are explained. Model numbers are decoded. 2017-08 Sachs 504/1 and 505/1 parts are illustrated, listed and some offered. Speed versions are explained. 2017-07 Parts/Drivetrain/Pedal Parts Pedals, pedal cranks and freewheels are shown and updated. 2017-07 Most original and replacement pedal cranks and measurements are shown, listed and offered. 2017-07 Pedal and freewheel threads are explained, including French thread freewheels on Motobecanes. 2017-06 Parts/Engine/Engine Hardware Shim washers and apps are specified, shown and offered. 2017-06 Parts/Electrical/Tail Lights Moped tail lights and parts, original on US models, are shown. 2017-07 Parts for CEV, ULO, Peterson, Stanley, Cateye, Saturnus, Fiem brands, and replicas are offered. 2017-05 Parts/Accessories/Mirrors Mirrors are updated, displayed, and offered. 2017-04 Brands/Slovenia/Tomos Models Tomos model photos, specs, VINs are shown and updated. 2017-04 Service/Electric/Vespa Electrical Many Vespa moped colorized wiring diagrams are shown. 2017-04 Confusing electrical systems, parts varieties, and corroded engine wires are all explained. This website does not have online ordering. Ordering is by phone or email. Before ordering parts, your moped’s identity must be known. The year, make, model, version, and serial number are stamped into the ID plate, usually located on the frame behind the headlight. Use the Brand menu to help learn the identity (year, make, model, version, ser#) of your machine and many of it’s components. Be aware there are some false names and remakes. Email Shaun at myronsmoped@gmail.com to ask questions. Please send pictures of the parts you are asking about. Shaun is often unable to answer many questions over the phone. Email Shaun at myronsmoped@gmail.com first, if there are several items or more, or if any of the items are not listed or require investigation. Your itemized order will be listed with prices, and sent in a reply, for your review. Any changes can be made. A revised order is sent in a reply. When it is final, then you pay by email (to PayPal), or by phone (to Myrons) usually. Payment by email: Ask Shaun to send a PayPal invoice. You don’t need an account to pay. You pay with a payment card, credit or debit. Shipping and Terms: Shipping is by USPS. Small items (small flat rate box or envelope) ship for $9, all 50 states, US Priority Mail, 2-3 days to most areas. A moped is a lightweight motorbike that can be pedaled. Most mopeds are made in Europe. Millions were sold in the US from ’76 to ’79 after the gas shortage. By 1985 the moped boom was over, and scooters became popular. A scooter has a floor, small tires, no pedals, and can have various sizes of engines from under 50cc to over 600cc. Most scooters are made in Asia. The smallest scooters are like mopeds in that they are both 49cc automatics that go 30 – 35 mph. 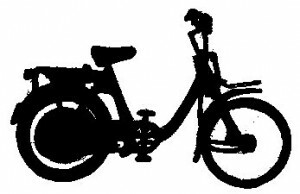 A moped means MOtor with PEDals, a hybrid vehicle half way between a small motorcycle and a bicycle. Since 2000 China has flooded the US with scooters that they call mopeds, causing confusion. Some USA states require pedals and some do not. In California, a “moped” has pedals, a 2hp motor and goes 30 mph. 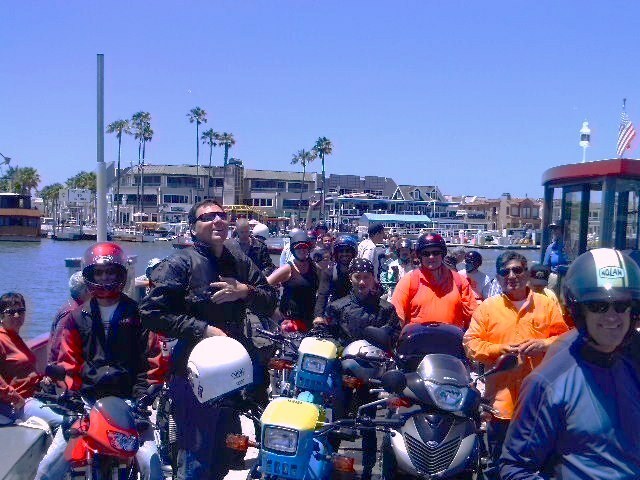 Mopeds, scooters, and motorcycles can also be electric. 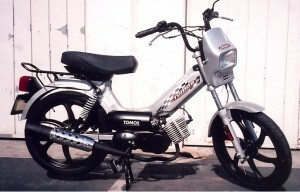 A 2008 Tomos Sprint is a moped. Some motor driven cycles are similar to mopeds. The National Highway Traffic Safety Administration (NHTSA) classifies anything with 2 or 3 wheels and over 5 horsepower as a motorcycle, and anything with 2 or 3 wheels and under 5 horsepower as a motor-driven cycle. So what appears on the VIN plates of all four examples below is Vehicle Type: Motor Driven Cycle, since they’re all under 5 horsepower. 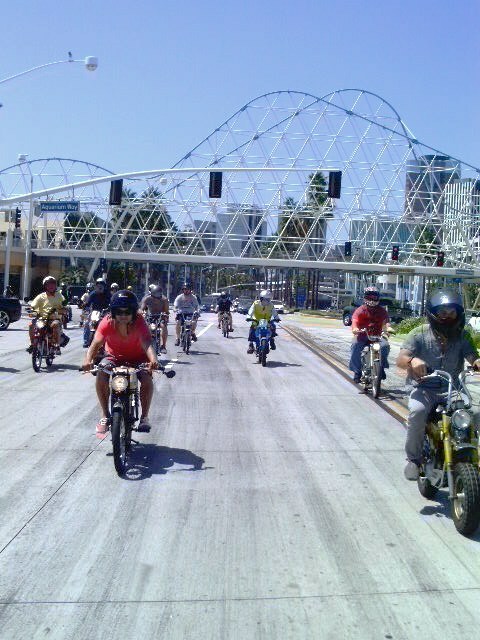 Here we divide the Motor Driven Cycle category into Mopeds, Nopeds, Scooters, or Small Motorcycles. This is because the parts inventory and service expertise at Myrons Mopeds is limited to true mopeds and some nopeds. Other types of motor driven cycles are excluded. 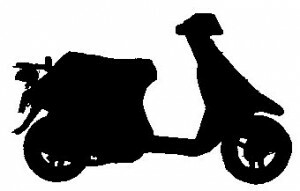 About the rise of mopeds in the 1970’s, and the fall in the 1980’s. They came from strange-sounding companies at first: Puch, Garelli, Batavus, and Tomos, to name a few. But once the craze was on, many of the big motorcycle manufacturers joined the fray. The Honda Hobbit, introduced in 1978, may have been the quintessential moped in name and appearance (especially name). The consumer appeal was easy to grasp: The moped was cheap, very cheap. Cheap to operate, cheap to buy, and free to insure. You could get a good one for about $350. That’s $350 for a machine that could take you anywhere you wanted to go at 20 m.p.h., and make it seem like a good time if there weren’t too many hills or big trucks around. $350! I spend about seventy bucks a week these days just on cough medicine and phone calls to the Motorcycle Industry Council, never mind transportation. 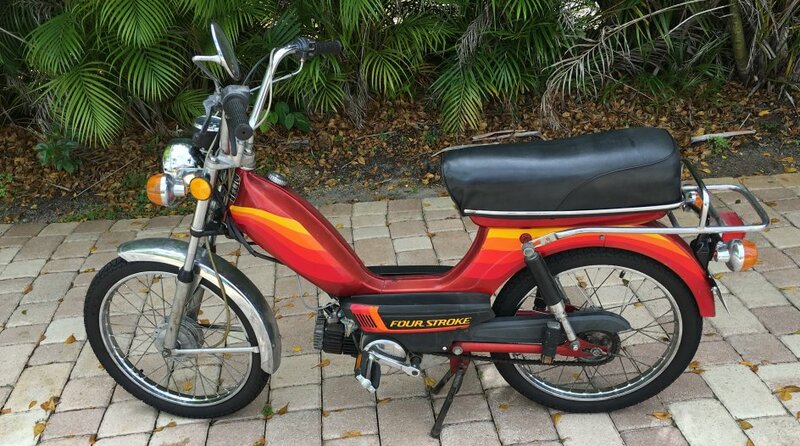 Moreover, the moped was fun to ride–it put you low to the ground with some wind in your hair and moved you through traffic sort of like a motorcycle did. And in a nation delirious about all sorts of moving vehicles and the trappings thereof (truckers and CBs, the Dukes of Hazzard and CHiPs, go-carts and slot-cars) the fun little moped fit right in. Sales jumped from 25,000 in 1975 to 75,000 in 1976 to 150,000 in 1977–and then doubled again in 1978. There were moped articles in every magazine from Newsweek to Glamour. They were popular with men and women, with the young and the old (and the very old, who liked to tool around retirement communities). They were sold in drugstores and newsstands, as well as your more conventional cycle shops, and everyone was back-ordered. Some high schools began to offer Moped Ed courses to eager freshmen. Nick Nolte and Jacqueline Bisset were in a ridiculous moped chase scene in The Deep. Jimmy Carter encouraged us to buy mopeds as part of his energy conservation program. And the Department of Transportation estimated that in the 1980s, America’s roads would be covered by two- to three-million mopeds. But the good days didn’t last. Lawmakers began to consider the safety issues raised when a vehicle with a top speed of 30 m.p.h. mingles with normal traffic (acceleration at stop lights was a big problem). There were some accidents: not as many as with motorcycles, but there were a lot more safety laws for motorcyclists–including helmet requirements. And in a moped accident, the mopeder always seemed to lose. Furthermore, the police became troubled by the fact that mopeds, with licensing optional in most states, were a good means of transportation for people who’d had their automobile licenses revoked. Resulting legislation greatly increased restrictions on the mopeds. Alas, public perception changed too: The novelty wore off, and the moped became wimpy. Sales leveled, then declined, then dropped off the map. By 1985, there were fewer than 12 moped dealers in the country, down from a late 70s peak of several hundred. Moped madness was over.